The Moe’s Southwest Grill of Tampa Bay co-op has 18 store locations throughout the Greater Tampa Bay Area. As one of the markets with the highest amount of store locations, Moe’s should have had strong brand awareness in the Tampa Bay DMA, but after a market analysis, we found that was just what the co-op was missing. Our media experts developed an integrated media plan for Moe’s that included radio, TV, direct mail and outdoor advertising. In our research phase, which included full brand immersion, the team uncovered that in order to stay relevant and innovative in the quick-service food category, we would need to include a strong social media strategy and presence for Moe’s that would help connect fans to the brand and engage them like never before. Development – After a channel analysis, we found a number of Moe’s Tampa Bay Facebook pages that needed to be consolidated into one, strong cohesive page. Working with Facebook, we were able to delete the outlying pages and direct fans to a new page that now serves as the main resource for all 18 stores in the area. Having one Facebook page for the co-op created a more cohesive brand and deterred employees or others from creating fragmented pages. Creation – The page was artfully designed with three distinct tabs. The landing tab called the familiar friendly greeting you’d hear echoing when walking in to any Moe’s Southwest Grill: “Welcome to Moe’s!” On the welcome tab, users had access to the menu, an interactive game called the Chip Flick Challenge, and the Food Mission, a wheel-shaped diagram that showcases the healthy options available at Moe’s. The second tab is a locator tab created for convenience, which can help customers find the nearest Moe’s by typing in any US zip code. Lastly, our team developed the poll tab to show users that Moe’s values the feedback shared by their fans and their customers. The administrator of the Facebook page can change the poll question at any time and has the ability to review the results. Growth – With the constant changes to Facebook’s algorithm, the most proactive way to create a fan base was to design and place Facebook ads encouraging users to “Like” the Moe’s Tampa Bay Facebook page. Using a modest budget, we created ads without an offer—just the call to action to “Like” the page for periodic updates and specials. Management – For Moe’s to become more than just a brand in the market, we knew we’d have to create a strong messaging strategy. Our social media team posts engaging messages on the Moe’s Tampa Bay Facebook, sometimes announcing specials and updates, or simply asking how fans are feeling that day and what they’re doing at work. Our social media department has a commitment to respond to any questions or comments within 48 hours. Although the development of any social media strategy, along with the design and programming of social media assets take more hours initially, we are now able to grow the Moe’s Tampa Bay accounts with a simple monthly management strategy. Development – Following our Facebook strategy, we developed one comprehensive Twitter account for Moe’s Tampa Bay that serviced the needs of all 18 store locations. Even with character restrictions in the title field, we were able to secure the ideal name “Moes_TampaBay,” remaining consistent with the brand standard established by the Atlanta corporate office. Creation – Taking a proactive role in the design of the Twitter account, our social media and design teams created a series of Twitter background themes that are interchangeable throughout the year. All of the themes showcased a different combination of their brand pillars – healthy eating, music and great customer service. At the launch of the account, a design featuring Moe’s signature green background was chosen, which prominently displayed the “Feed the Moement” slogan and listed each of the stores in Tampa Bay. The profile picture is the Moe’s logo. Messaging – To launch the Twitter account, our creative department created 50 fun fact tweets regarding Moe’s and their delicious southwestern fare. Our social media experts loaded these tweets into a rotation and tweeted them during the day alongside regular messaging which included tweets to engage customers and tweets about specials, such as Moe Monday and Cinco de Moe’s. As with the Facebook page, our social media department has a commitment to respond to any questions or comments within 48 hours. Growth – To grow the Twitter account, our keyword analysts used geo-location targeting to follow people based on a variety of keywords or phrases. So, if you’re in the Tampa Bay area tweeting about burritos, you can bet Moe’s is following you, or will be soon. Soon after the Facebook ads launched, Moe’s Tampa Bay experienced a 440 percent increase in fans and received nearly 500,000 impressions in just the first week. In three months, the Facebook page received 3,869 clicks and 84 percent of the people who made those clicks became a fan of the page. Also within three months, the post feedback had increased by 329 percent and continued to grow each month. The Twitter following strong, with nearly 1,750 followers acquired in just three months time. Moe’s Tampa Bay has also been listed 23 times on lists such as @ConnieFoggles/AwesomeBrands and @Tweets4Tampa/Hmm-Food. Moe’s Tampa Bay now consistently ranks among the highest sales and greatest guest experiences across the international footprint. 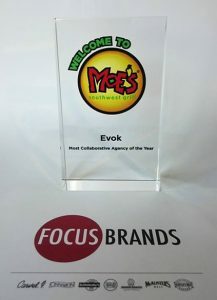 We are proud to have received Focus Brands’ “Most Collaborative Agency of the Year” award as a result of our agency’s collaborative efforts with Moe’s Southwest Grill.